Jessie and Sheldon tied the knot with a beautiful outdoor, garden wedding at historic Carnton Plantation in Franklin Tennessee. 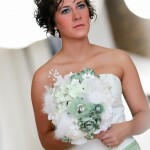 Jessie and her bridal set of six carried timeless, paper bouquets, designed in Jessie’s sage wedding colors. 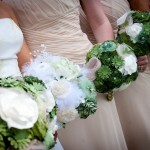 Each bouquet was part paper, part fabric and ALL amazing. 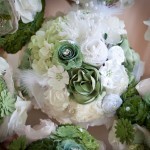 Jessie’s bridal bouquet was a diverse masterpiece, composed of roses, peonies, rosettes, poppies and a gorgeous hydrangea! 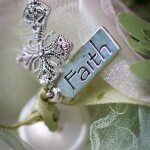 Each bouquet was personalized with relevant, hand-selected charms, making each bouquet even more sentimental! 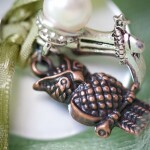 Jessie’s sorority mascot was an owl, and she married a former professional rodeo rider. 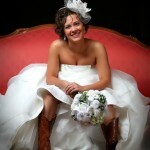 Hence, her bouquet featured an owl charm alongside a pair of cowboy boots. 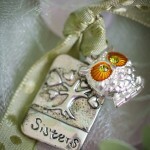 One of her bridesmaids, a sorority sister, shared an owl charm in her bouquet as well. 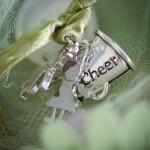 The bride’s childhood friend was also a fellow childhood cheerleader so her bouquet featured appropriate charms. Another bridesmaid hailed from Kansas, the bride’s new home, and so her bouquet featured a sunflower charm, the Kansas state flower. 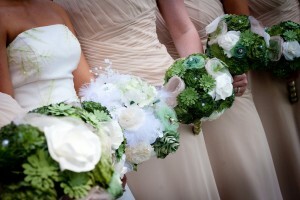 The mother of the bride and mother of the groom wore stunning, handcrafted corsages featuring gorgeous white roses, each similarly personalized with appropriate, sentimental charms. 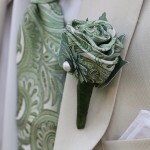 Sheldon, the groom, sported a stylish, handcrafted boutonniere, a single rose, creatively made from a paisley tie, the same ties that his groomsmen wore. 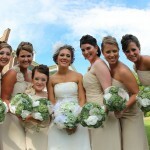 Jessie and her bridesmaids will enjoy their timeless, handcrafted bouquets for a lifetime! This entry was posted in Real Wedding and tagged boutonniere, Carnton, classic, Franklin, green, hydrangeas, outdoor, paper, Plantation, read wedding, sage, traditional, wedding, Wyatt. Bookmark the permalink.